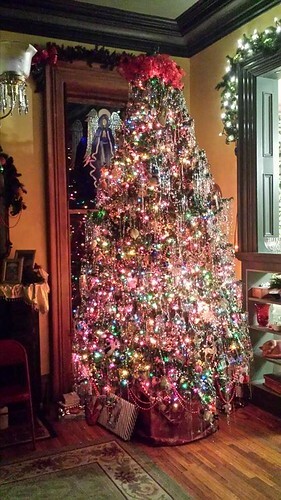 DH took this picture of the tree in the living room. This is our family tree. It holds the kids’ ornament collections, our family ornaments, the ornaments the kids’ have made during grade school, etc. It is beaded with a double strand of red beads, decked with popcorn and cranberry strings, and finished with silver tinsel icicles. We make popcorn and cranberry strings because the tree my mother put up always had them. 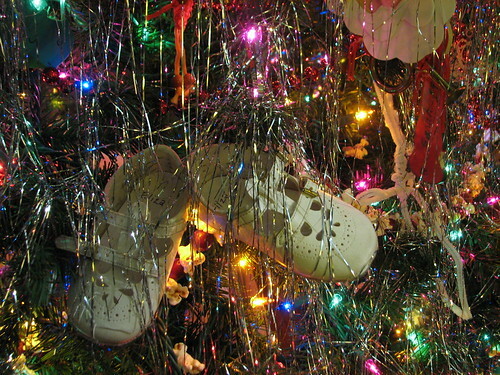 I asked my Dad last week why she always made them for the tree. 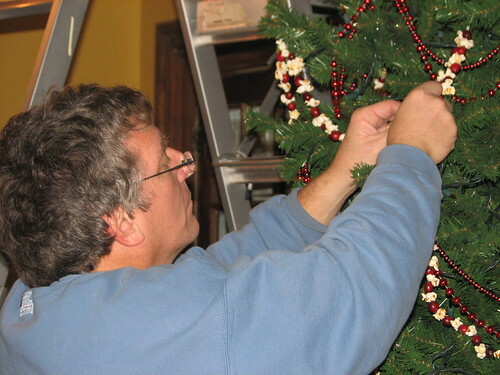 He said a lot of people used popcorn and sometimes cranberries to decorate their Christmas trees when he was a child. Both his and my Mom’s parents used them on their own trees. 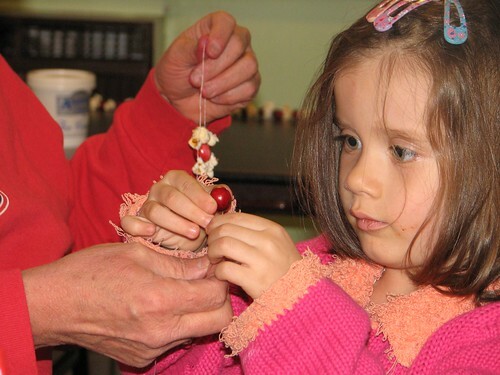 Snow White enjoyed making them with her Great-Aunt Genny two years ago. 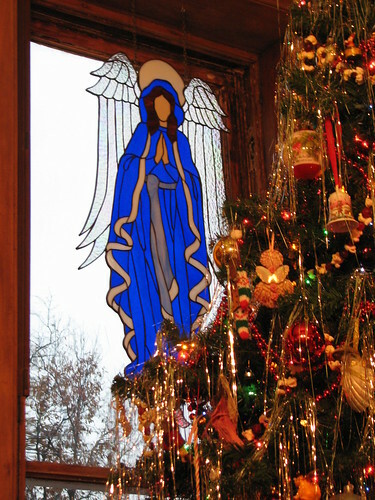 The stained glass angel in the window behind the tree was made by our dear friend Gary. 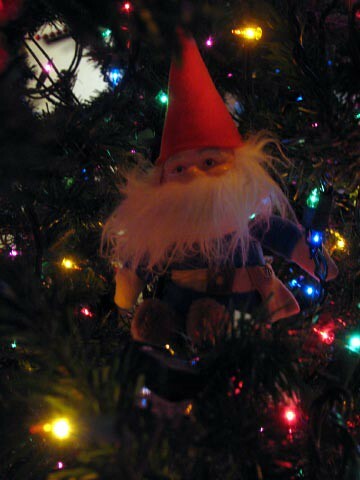 If you peek inside the tree, you may catch a glimpse of our wood gnome sitting on a branch. My mother gave him to me thirty-five years ago, the year our first child was born. This tree doesn’t change much, year to year. A few new ornaments each year, but basically the same. This picture of Rose Red was taken five years ago. 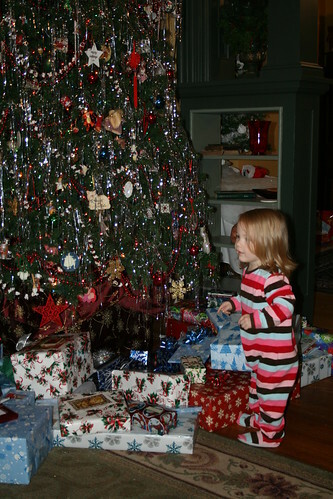 She was delighted with the tree! The fact that it revolved just made it that much better! It’s time to think about getting your own tree up if you haven’t yet. Only eighteen days until Christmas! This entry was written by ~~Rhonda, posted on December 7, 2014 at 11:23 pm, filed under Christmas, decorating for Christmas, trees. Bookmark the permalink. Follow any comments here with the RSS feed for this post. Post a comment or leave a trackback: Trackback URL.